"This is a mouthwatering tender roast with vegetables and a great gravy that gives a fantastic presentation for a dinner party, or for a family New Year's Eve dinner. It slow cooks once browned, so you can be straightening up the house while it simmers. You can get the boneless shoulder roast and roll it very tightly yourself and tie it several times with butcher string. Sometimes if you explain to the butcher, they will do it for you. Great served with fresh steamed asparagus or green bean spears." In an 8 quart Dutch oven over medium-high heat, brown roast on all sides. Add thyme and 2 cups of water. Heat to boiling, then reduce heat to low, cover, and simmer 30 minutes. To the pot, add carrots, potatoes and onions. Cover, and simmer 30 minutes. Toss in mushrooms. Cover, and simmer 15 minutes, or until vegetables and veal are tender. Remove roast and vegetables, and keep warm. In a cup, stir flour and 2 tablespoons water until blended with no lumps. Gradually stir into liquid in Dutch oven. Cook, stirring constantly, until gravy is slightly thickened. Stir in peas, and heat through. In a small bowl, beat egg yolks. Stir in a small amount of hot gravy. Slowly pour egg yolk mixture back into gravy, whisking until thickened. DO NOT BOIL! To serve, pour some gravy over the veal and vegetables. Serve remaining gravy in a gravy boat. 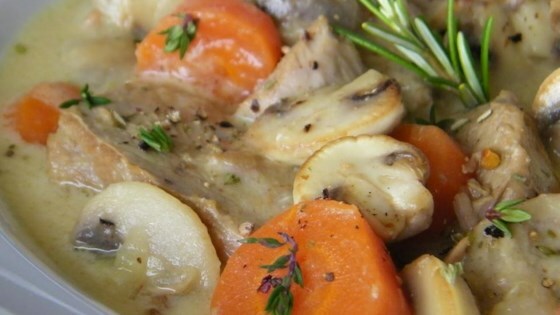 Traditionally, the veal is kept "white"-not browned. I prefer browning it, but you may skip this step. Yes on tender, no on pleasing the boss! I even added salt, pepper and brandy. Definitely no depth of flavor with this. I have other recipes that I'll use when the boss comes over. Great meal - family loved it. The veal was wonderful. Will make this again - and again. Wonderful! We truly enjoyed this recipe. I only added a little extra thyme and pepper. The gravy was fantastic. Thank you for sharing! Great recipe, have made it twice now. I recommend salting the water before cooking and adding the vegetables you can make some tasty variations. Great recipe Anne, thanks.